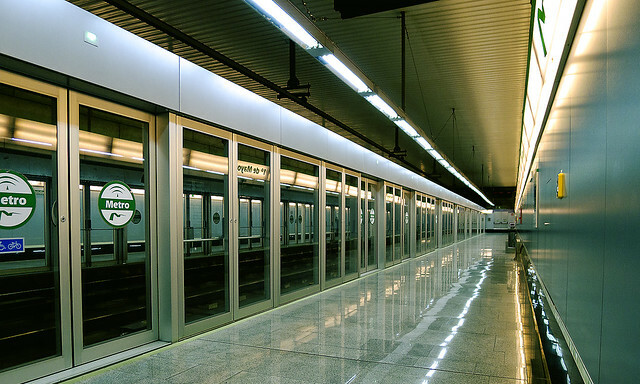 Metro Sevilla, the city subway, was recently inaugurated. The network has currently one line although the City Hall is running major works to expand it. The initial project includes a total of 4 lines by 2017 but the route of some of the lines has been very controversial and the works have been delayed. 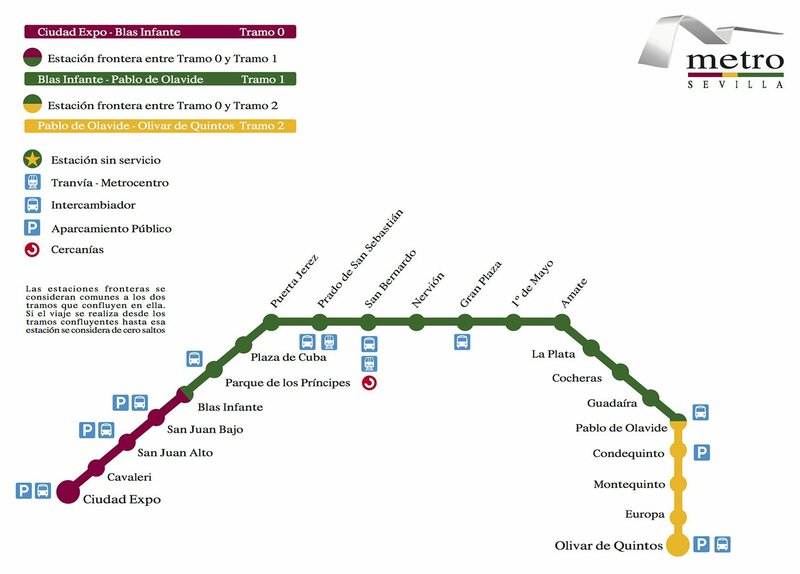 The line 1 goes from Ciudad Expo to Olivar de Quintos, crossing Seville from west to east. It was inaugurated on April 2nd, 2009 and it has 22 stations. In the city center, the line is subterranean whereas in the outskirts it becomes aerial. Below is a map that includes the current line 1. There’s also another one showing the future lines 2, 3 and 4. The following table shows the Sevilla Metro operating hours. It will depend on he day of the week. (*) Departure of the last train from the first and last station of the line. Note: The operation hours shown in the table above may change if there is a public holiday (fiesta). Check the extended operation hours either through the internet or with the Metro Sevilla personnel. These extended hours apply mainly during the Semana Santa and the Feria de Abril. Metro Sevilla sells tickets only using an e-wallet (monedero electronico). There are several types of tickets. It’s a digital card (usually the size of a credit card) that allows you to charge it with some credit. You can then pay your purchases by sliding the card along an electronic sensor that will register the transaction and will charge you from the credit of the e-wallet. It allows you one trip per person within Metro Sevilla. Your e-wallet allows you a maximum of 9 single tickets recharge. Be careful, you can only recharge once. If you are traveling in a group and to the same destination, the whole group can benefit from a one e-wallet. Once you have used all your single tickets don’t throw away your e-wallet: it can be used differently (see the BonoMetro section). Very similar to the single ticket. The only difference is that you can have a maximum recharge of 4 round trips. A good option is recharging the e-wallet with a 1 day ticket that gives you an unlimited number of journeys for that particular day. It’s personal so no one else can use it but you. Again, once the e-wallet is used you can use it as a BonoMetro. This ticket has a minimum credit of 5€ and a maximum of 50€. And you can share it with your group members as well! The main advantage is that it can be used on more than one means of transport and it will be counted as a single journey provided that your total journey is less than 2 hours. A quick example will make things easier. Imagine that you take the Sevilla metro and travel between Plaza de Cuba and San Bernardo. You then leave the metro and jump on a bus using the same ticket to finish your journey. But this is only valid as long as the total length of the journey is less than 2 hours. You could do it the other way round of course (first bus, then metro). Now, be careful if you re-enter the metro once you have left it will count you as another journey. It has a minimum credit of 10 euros and a maximum of 50€. As for the Single and Return ticket, you can share it with your group members as long as you all go to the same station within the Metro Sevilla network. With a Bono 45/30 you can make 45 identical trips within 30 days. This offers you a 20% discount compared to the BonoMetro and 44% discount to the single ticket. It costs 30€ if you don’t plan to do any hops (keep reading, there’s an explanation below of what a hop is), 42€ for 1 hop and 50€ for 2 hops. This ticket is only valid at the Metro Sevilla network so you cannot combine it with other means of transport. The journey fare is determined by the number of ‘hops’ (saltos) you’ll have to do between your origin and your destination. As you have imagined, a ‘hop’ is the passage from one tariff zone to another. In the diagram below you can see that there are 3 tariff zones in the line 1. The official Metro Sevilla website displays every combination ticket/fare. Note: Fares are updated annually as of July 1st. So this information is valid only until then. 2. If you plan to make more than 3-4 journeys, consider buying a Bono to save some money. 3. Generally people don’t know that you can get an additional 10% discount if you spend more than 50€ per month or a 15% discount if it’s more than 80€ per month. 4. Would you like to calculate your metro journey time? As a general rule of thumb, estimate 3 minutes per stop. If you are connecting with other means of transport (e.g. a train like the Cercanias) you should increase your calculations by 10 minutes. Bear in mind that on Sundays, holidays and evenings the frequency is lower so add 7-8 minutes to your estimate.